Nonetheless, I had SO much fun and so many memories in the past couple of weeks. Let the pictures talk ba! After a long day full of taking graduation pictures and relatives gatherings, my friends and I stayed at hotel room in downtown Boston. Perfect for going out and not driving! Went to eat afterward, saw our old friend! Went to Korea Town for soon dubu (BCD Tofu House). YUMM! Their bbq meat are the superb but this time we decided to try out their organic tofu soups. Why did I go to Fifth Avenue? For Purses? No! For Clothes? No! For the LOVE sign? No!! I am usually not a burgers fan but I was in loveeee with their burgers! Went to the outlet yesterday back in Mass. I found the elephant necklace I had been longing for for decades from jcrew. The last two times they didnt have it. Finally got it, yeah yeah literally made my day! 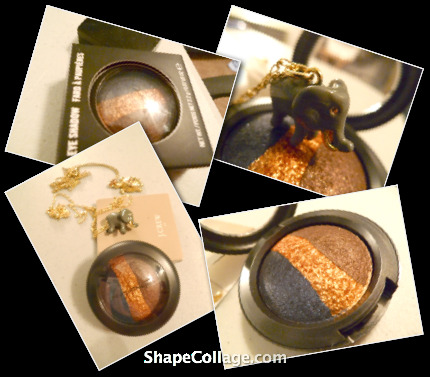 I also purchased the MAC Fard A Paupieres eye shadow in Inter-View from the CCO there. The shimmery blue is even darker then any blacks I have owned. The gold color is gorgeous with orange glitters. The brown is perfect for build ups ranging from medium to super opaque. All super pigmented. Itd be very convenient for doing night out makeup with the combination of colors matching both warm and cold tones. I just like everything in this post. And New York, gosh I been a couple of times, I hope you had a good time there. yay for graduation!!! Looks like u guys had a blast! I'm so happy for u =) five guys look delicious... I totally need to go try it out next time I visit! looks like you've had fun! aahw jealous! i want to go to NYC too. Congrats!! You deserve yourself a ...Five Guys burgers! I have never had the chance to taste it, but yes, the notorious burger is said to be heaven made.